It’s Shaggy Pony Update time. 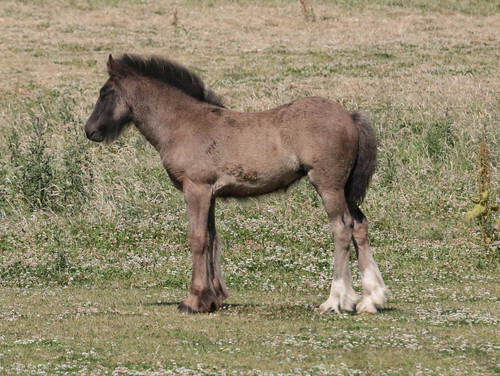 Look at how tall Foal is getting! 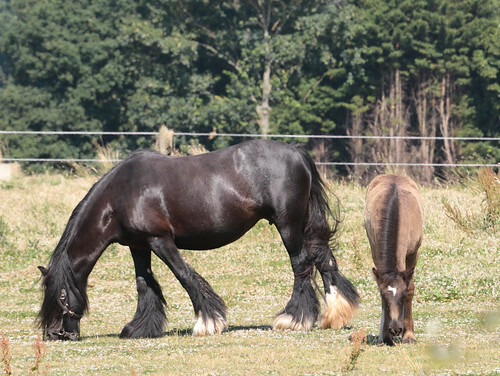 For perspective, here is Foal with its mummy, Cousin It. Foal has started spending more time napping and grazing away from Cousin It’s immediate vicinity. In other news, tonight we attempted to get the children to watch the England-Colombia match. There was exhaustive “Who are the ones in red/yellow/black/blue/green” questioning. There were sporadic outbreaks of “England, come on England” chants. (It was very weird for me to hear that from my children. Especially on the eve of Revolting Colonial Day.) But mostly they wanted to build a long train out of the trucks in the front room and drink hot chocolate, which they're hardly ever allowed. A mixed success at best. This entry was originally posted at https://nanila.dreamwidth.org/1170581.html. The titration count is at .0 pKa. The baby has grown a lot for sure - and its coat is getting lighter as well, isn't it? Yep, its coat has been lightening steadily over the past few weeks. It makes me wonder if it will retain those white socks on its back feet.